I've recently run an update on one of my IOKs and it appears that the lats and longs default reference to Yahoo! has been broken. The default is reporting back a 503 error. Screenshot attached. Cloudmade is functioning fine, for now. As shown, 503 error means the server is temporarily overloaded or under maintenance. Any external service like this is liable to this sort of issue occasionally. Try later. 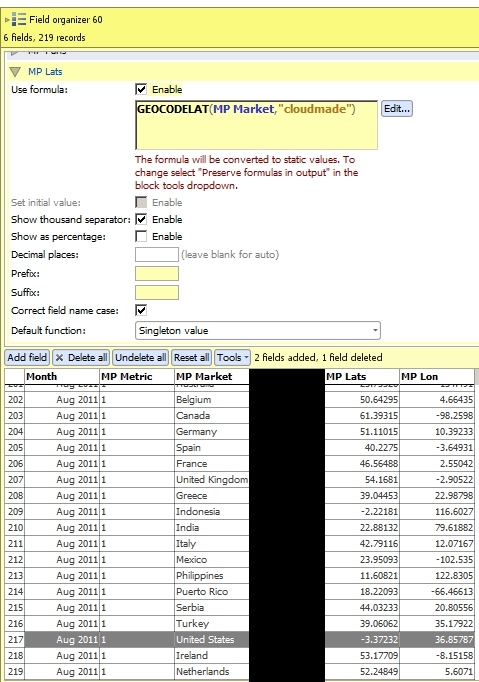 Also worth noting that the cloudmade option is returning screwy lats and longs. For the United States it is returning lat -3.37232 long 36.85787, which is somewhere in Tanzania. Screenshot attached. Looks like hard coding is the only reliable solution to this. Different providers have different behaviour, and geocoding text addresses sometimes involves guesswork. You might find it better if you append text to the query to give it more context. So, if you are searching for places in the US, append ", US" to the text you are passing to the geocode functions. The more information you give it, the more likely it will get the right place. I replied without consulting your screenshot. If you're just trying to geocode country centres, we have a lookup for that. 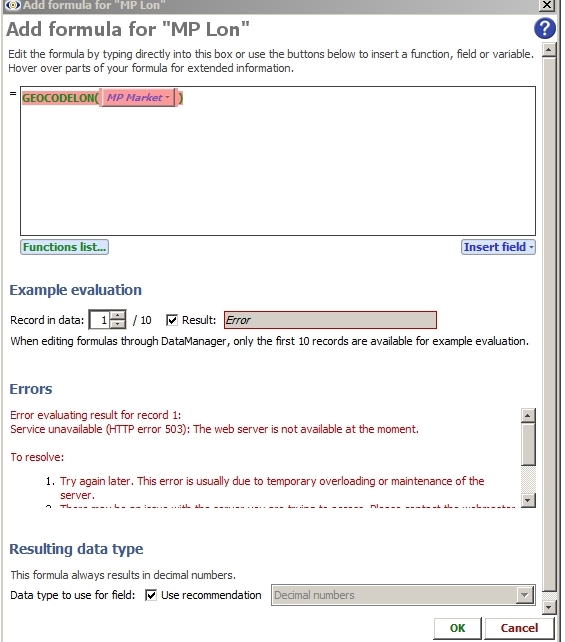 Use Data > Operations > Merge/Join, and choose a "Lookup data" in the external data drop-down. Pick "Locations - Countries". You'll need to make sure the country name is correct first.